A talk given to the Civil War Roundtable at the Royal Canadian Military Institute, Toronto, March 28, 2018. The Intention of this talk is to discuss the little known role of American Civil War veterans in the expansion of the 19th century Egyptian Empire into Africa. As those here tonight are primarily interested in the US Civil War rather than 19th century African history, the talk will begin with a summary of how the Americans came to be in Egypt as mercenaries and their part in Egypt’s failed invasion of Abyssinia (modern Ethiopia). It proceeds in Part Two with profiles of some of the most prominent Civil War veterans serving in Egypt. American military involvement in Egypt, whether official or unofficial, dates back much further than many might expect. In an early American attempt at regime change in the Middle East, the young republic’s consul in Alexandria, William Eaton, led a motley army composed of a handful of US Marines, and hundreds of Greek, Arab and Turkish mercenaries recruited in Egypt to put Thomas Jefferson’s preferred candidate on the throne of the neighboring Karamanli state of Tripoli in 1805. Following a five hundred mile forced march from Alexandria to Tripoli, Eaton’s frequently mutinous army took the Libyan city of Derna in America’s first overseas land battle. 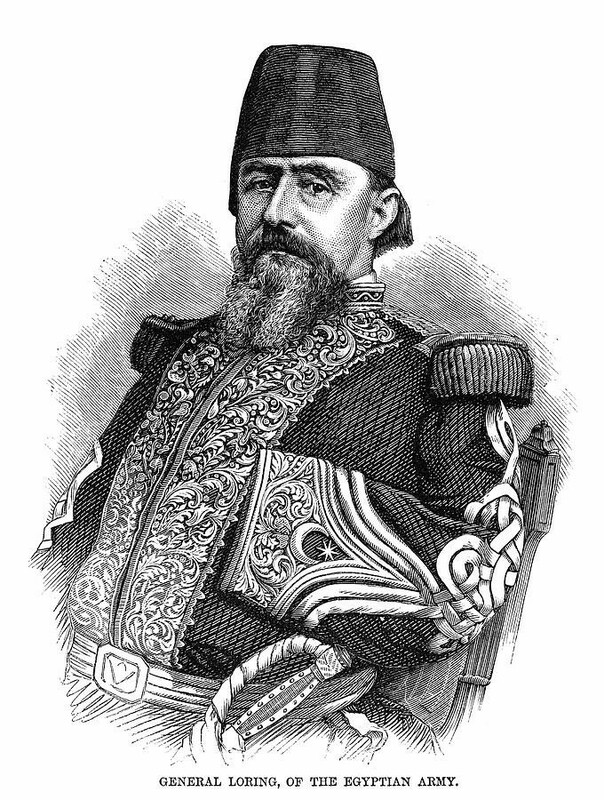 At the same time, an ambitious Albanian, Muhammad ‘Ali Pasha, was emerging as the victor in a power struggle for control of Egypt, still an Ottoman domain. 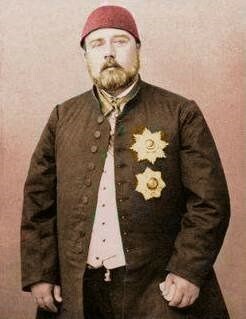 By force and intrigue, Muhammad ‘Ali became the Sultan’s khedive (viceroy) in Egypt, though the Albanian’s real plan was to eventually replace the Ottoman Empire and establish his own hereditary dynasty. In 1811, he slaughtered most of the powerful Mamluk military-slave caste (his last opposition) in an act of treachery. In 1821, the viceroy sent an army south to conquer the Sudan. Three Americans who converted to Islam joined the expedition, though it has never been confirmed whether they were acting as mercenaries or spies. Egypt’s ruling class was a combination of Turks and Circassians who typically spoke Turkish and French, but rarely the Arabic of the people they ruled. Circassians from the North Caucasus had been brought to Egypt for centuries as slaves to receive military training and Circassian women, famous for their beauty, filled the harems of the Middle East’s rulers. Though the Mamluk system had been broken in 1811, Circassians and their descendants continued to play major roles in the Egyptian military until the revolt of the Arab officers overthrew the dynasty of Muhammad ‘Ali in 1952. 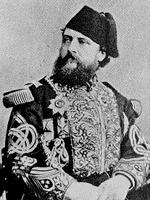 Muhammad ‘Ali’s grandson Ismail became the fourth Khedive in the dynasty’s line in 1863. It was a good time to take over; Egypt’s cotton industry had filled the government coffers as Egypt profited from the Civil War blockade around the cotton-producing southern states. 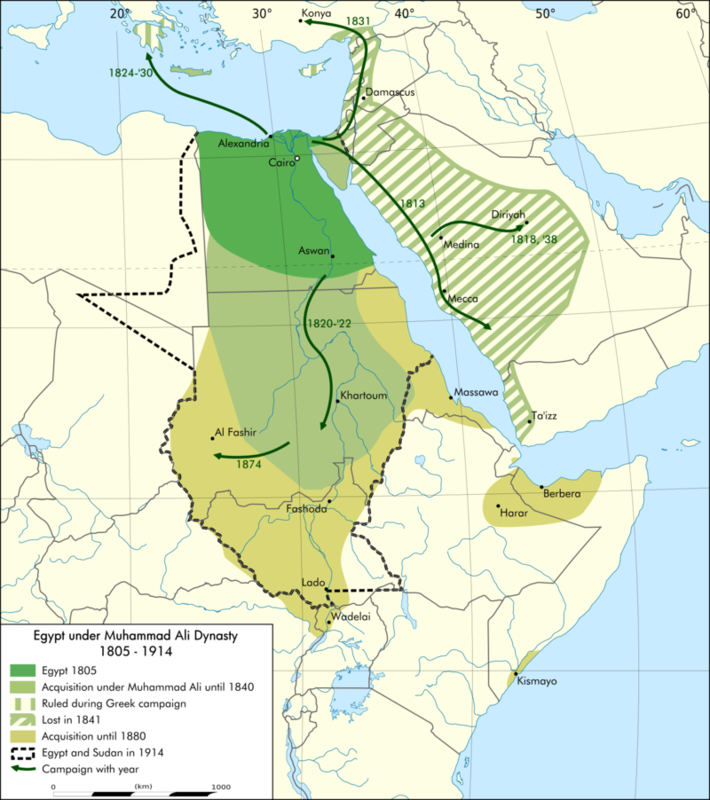 Ismail was determined to consolidate Egyptian power over the entire Nile Basin as well as the Red Sea coast. Though Egypt had a large degree of independence, the Khedive was still the servant of the Ottoman Sultan and Egypt was expected to contribute militarily to Ottoman wars if called upon. To build his empire Ismail required soldiers from a nation with no strategic or colonial interest in Africa. The sudden availability of many experienced officers after the American Civil War fit the bill perfectly. Unfortunately, Ismail’s combination of ambition, extravagance and enthusiasm for borrowing cash on the international money markets would ultimately bring about his downfall and an end to the American military presence in Egypt. To recruit these officers, Ismail turned to Thaddeus Phelps Mott, an American serving as a major-general in the Ottoman Army. When the New York City-born Thaddeus Mott enlisted in the Union Army as a 30-year-old in 1861, he was already a veteran of Garibaldi’s Redshirts in Italy and the Mexican Army. He had also spent several years at sea as a mate on clipper ships. Fluent in a number of languages, Mott was an excellent swordsman and dead shot with pistols who enjoyed duelling. As a Union artillery commander, Mott saw heavy action in the battles of the Seven Days, but some of his most desperate moments came in his native New York as a lieutenant colonel of cavalry during the 1863 Draft Riots. Facing thousands of furious rioters, Mott killed one man with his saber who was trying to pull him from his horse. Mott then ordered the guns under his command to sweep the streets with grape and canister shot. Three years after the war Mott joined the Ottoman Army’s general staff and was stationed in Egypt. Seeking Western military experts who did not need to clear all the Khedive’s orders with their embassy (as did Ismail’s French advisors), Ismail turned to Mott to recruit American civil war veterans who were free of colonial baggage. Mott in turn contacted General William Tecumseh Sherman, who agreed to recommend a number of veteran officers from both sides of the Civil War. 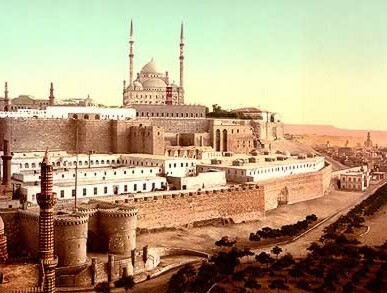 Sherman had visited Egypt in 1869 and was well treated by the Khedive. Mott became aide-de-camp to Ismail Pasha in 1870, but declined to renew his contract in 1874. 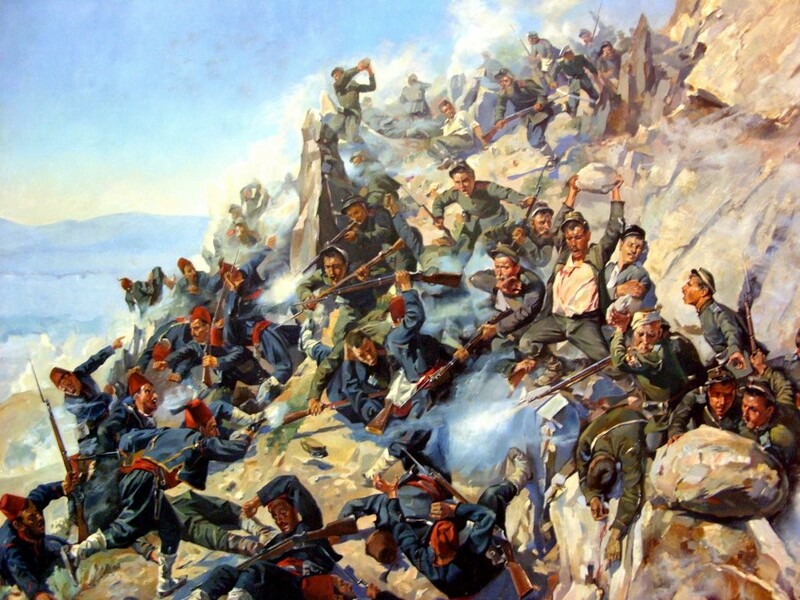 He instead returned to Turkey to take part in the Ottoman wars in the Balkans, distinguishing himself against the Russians at the Battle of Shipka Pass in 1877. Mott died in Paris in 1894. Many of Sherman’s recommendations appear to have been made with the goal of sending discontented Union officers on half-pay and Confederates of suspect loyalty out of the country. A number of key Civil War figures, including former Confederate Generals Joseph Johnston, P.G.T. Beauregard and George Pickett, considered the proposal but declined for various reasons. However, service in Egypt was considered respectable employment and many of the officers who accepted came from some of the most distinguished families in America. On their arrival in Egypt, the Americans found an army suffering from illiteracy, no command structure, no intelligence apparatus, no signals corps, antique artillery and persistent ammunition shortages. The entire Egyptian army possessed only three maps. Some of the Americans were put to good use in exploration, training and engineering projects, while others had little to do and killed the boredom with drinking and dueling over petty disputes, some of them dating back to the Civil War. Many of these latter officers made early returns to the United States. There was no pay department in the Egyptian Army, which at times forced the Americans to collect their salaries at gunpoint when it was months in arrears. Otherwise they accumulated debt which they had little hope of repaying, making the avoidance of creditors their main occupation. As Muslims, the ladies of the Egyptian aristocracy were strictly off limits to the Christian Americans. There were Syrian, Greek and Armenian Christian women in Egypt, but they tended to live the same veiled and secluded life as their Muslim counterparts. The Americans instead turned for female companionship to the European ladies performing at the Cairo theaters and opera. While some French officers of Napoleon’s occupation army (1798-1801) had converted to Islam to marry Muslim women, it does not appear that any of the Americans did the same. On a professional level, there were difficulties from the start in relations with the existing officers of the Egyptian Army, who resented the American presence and no doubt endured a certain amount of arrogance from the Civil War veterans. Egypt was a culture shock for many Americans; one officer described his surprise that eunuchs in the royal court were “beings of great importance” and was warned that they were not to be offended on any account as they had the ability to inflict serious harm on anyone who did so, including Americans. Ismail’s expansion into the Horn of Africa brought his troops into conflict with those of the Abyssinian emperor, Yohannes IV. After an Egyptian detachment was massacred, it was decided to send a massive invasion force under Ismail’s son, Prince Hassan Pasha, to punish the Abyssinians. Emperor Yohannes had actually sent a letter to the US Secretary of State in 1872 requesting US help in preventing Egyptian moves on Christian Abyssinia. He also proposed a bilateral commercial treaty. No response was sent from Washington, and when Americans did arrive, they were part of the Egyptian invasion force. Language was a problem throughout the campaign. The command language of the army was Turkish, spoken by officers who refused to learn Arabic, deriding it as the language of Egypt’s fellahin peasantry. Translators were thus needed to communicate with the Arabic-speaking rank and file. Some French-speaking Americans could communicate with the Turko-Circassian officer corps, but the rest required translators to speak to both officers and men, making the transmission of orders slow and complicated. The Americans were also in the strange position of fighting their fellow Christians on behalf of a Muslim nation, but they tended to regard Abyssinian Orthodoxy as a barbaric form of the Christian faith. The Americans were also astonished that the Egyptians insisted on including a regiment of Sudanese blacks in the expeditionary force. Their own prejudices made them overlook the fact that the Sudanese troops were the finest and most experienced in the Egyptian Army. Many in the regiment had distinguished themselves fighting on behalf of Maximillian in Mexico at the same time the Civil War was raging north of the border. Once in Abyssinia, both Americans and Egyptians alike were shocked by the extreme form of psychological warfare used by the Abyssinians. Prisoners were subjected to horrible genital mutilations and then released naked and bleeding to find their way back to Egyptian lines. The impact on the Egyptian troops was devastating. During a massive battle at Gura that lasted two days in March 1876, the Egyptian Army was badly defeated by native troops armed with far inferior weapons. American officers complained that the Egyptians failed to attack, preferring instead to “stand still and be killed like sheep.” The Americans attributed this fatalism to the work of the Islamic Imams attached to the expedition and the failure of the Turko-Circassian officers to adopt an aggressive attitude. While the rest of the Egyptian officer corps returned home to acclaim and decorations, the Americans were ordered to remain at the Red Sea port of Massawa through the brutal summer heat. When they were finally allowed to return to Cairo, they found the Turko-Circassian officers had prepared the way with humiliating accusations of American incompetence. In 1877, Prince Hassan led an Egyptian expeditionary force to assist the Ottoman Turks in their war against Russia. The remaining American officers, still blamed for the defeat in Abyssinia, were not welcome. By 1878, most of the American mercenaries had been decommissioned and sent back to the United States. Because of a spiraling national debt fueled by Ismail’s financial extravagance and growing political pressure from his main creditors, the British and French, Ismail was forced to abdicate his throne in 1879 in favor of his son, Tawfiq. Ismail died in debauched exile in Constantinople, the final straw being an attempt to guzzle two bottles of champagne in one go. It did not take long for the achievements of the Americans in Africa to be forgotten. Their service as Christian mercenaries in a Muslim state was eventually regarded as something of an embarrassment in both Egypt and their home country. Charles Pomeroy Stone fought in most of the major battles in the Mexican-American War and was twice promoted during the campaign for outstanding performance on the battlefield. When the Civil War broke out, General Winfield Scott put Stone in charge of Washington’s defenses, to which Stone applied himself with great energy. However, a few months later Stone ran afoul of abolitionist Republicans when he followed the government’s own policy by returning runaway slaves to Maryland. Shortly after that, Stone ordered a reconnaissance in force across the Potomac at Ball’s Bluff. Waiting Confederates killed over a thousand Union troops, including their commander, a Republican senator. Stone, a Democrat, was the scapegoat for this disaster. He was denied a court-martial and was instead sent to prison without charges at Fort Lafayette in New York harbor for 200 days. He was released through the intervention of General Ulysses S. Grant, but remained under suspicion as a potential traitor for the rest of the war. Stone Pasha remained loyal to the dynasty even after nearly all the other Americans had gone home and most notably protected Ismail’s successor Tawfiq during the British bombardment of Alexandria in 1882. After Stone returned to the United States he continued working as a civil engineer. In 1884 he was the chief engineer on the Statue of Liberty project but fell ill after attending the dedication on a cold blustery day. 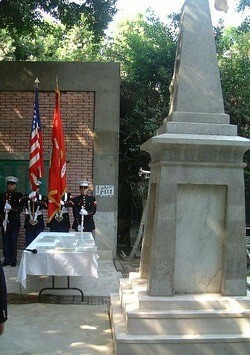 He died several months later and was buried at West Point. William W. Loring never attended a military school. Instead, he learned soldiering in the field, beginning as a 14-year-old volunteer with the Florida state militia. Eventually he was commissioned in the pre-Civil War US Army, in which he participated in the 1857-58 Utah expedition (also known as the Mormon Rebellion) and the Indian Wars in the west. Loring lost his arm during the storming of Chapultepec Castle in Mexico. Legend has it that he smoked a cigar during the amputation. Loring’s Civil War service was infused with controversy; after feuding with his superior Stonewall Jackson, the Confederate general had Loring charged with “neglect of duty” and “conduct subversive of good order and military discipline.” Fortunately for Loring, the War Department did not pursue the charges and wisely sent Loring far away from Jackson. At the Siege of Vicksburg, Loring repulsed an advance by General Grant but his command later became separated from the Confederate garrison inside the city. 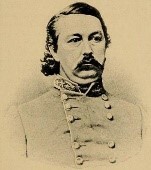 The Vicksburg commander, John C. Pemberton, blamed Loring for the fall of the city. Loring would serve ten years in Egypt, beginning as Inspector General of the Army. At one point he escorted his old Vicksburg rival President Ulysses S Grant during his visit to Egypt. 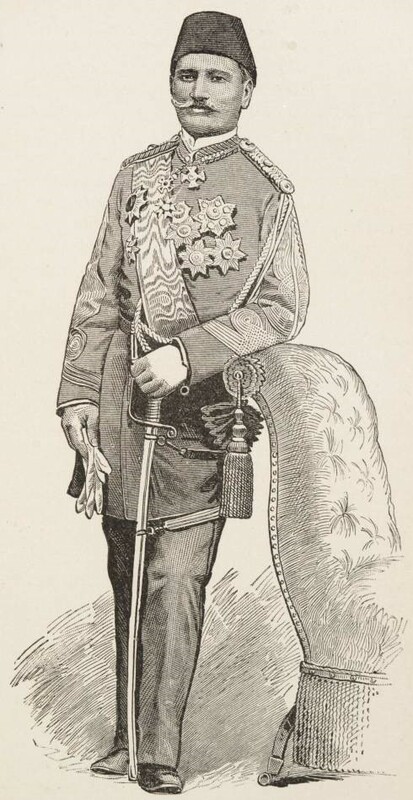 In 1875 Ismail placed Loring in charge of the expedition to punish Abyssinia for its interference in Egypt’s expansion along the coasts of the Red Sea and the Indian Ocean. Ismail implored Loring and Ratib, the Circasssian commander of the Egyptian Army, to work hand in hand. Once in the field, however, Ratib and his fellow Turko-Circassian officers created a parallel command structure using verbal commands, a custom in the Egyptian army where even many officers were illiterate. Furious disagreements between Loring and Ratib over the conduct and purposes of the war were a major factor in the disaster at Gura. Using an Eastern conception of war as a demonstration of strength that preceded negotiations, Ratib insisted on building forts in the Gura Valley. Loring, a fresh graduate of the “total war” philosophy that had destroyed the Confederacy, wanted to continue marching into the Abyssinian interior to destroy armed resistance. After his return to the United States, Loring wrote his memoir, A Confederate Soldier in Egypt. Loring was buried in St. Augustine, Florida, in 1897 in one of the largest public events in the city’s history. By 2018, local social justice warriors wanted to tear down his grave monument and expel his remains from Loring Park. A statue of Loring commissioned in 1911 still stands at Vicksburg and does not yet appear to be threatened. 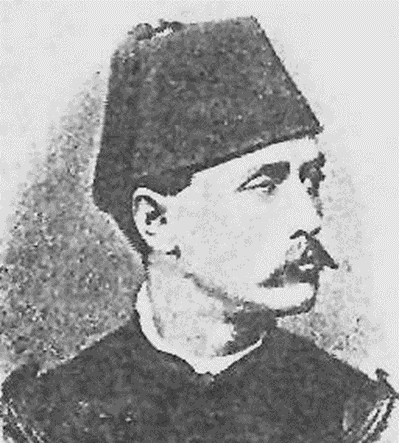 Loring’s antagonist, Ratib Pasha, was one of the last Circassians to be brought to Egypt as a military slave in the 19th century. Unlike the earlier Mamluks, who tended to be powerful men with expertise in all the arms of the day, Ratib was only five foot four and roughly one hundred pounds. 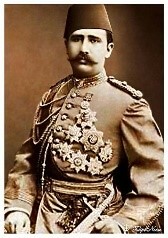 He had little military training and had served as a royal equerry during the reign of Khedive Abbas Pasha. At some point Ratib angered the Khedive, who struck him. The mortified Ratib attempted to shoot himself but only succeeded in blowing off part of his nose. To make amends, Abbas appointed the small man commander-in-chief of the Egyptian Army. Unsurprisingly, many of the American professional soldiers had little respect for Ratib and presented him with a series of small humiliations, none of which Ratib was likely to forget. One of the Americans described Ratib as being “as shriveled with lechery as the mummy is with age.” Another officer cited Ratib’s “insane jealousy and intolerance of foreigners,” which compelled him to ignore all military advice from American sources. The nominal command of the Abyssinian expedition was entrusted to the Khedive’s son, Prince Hassan Pasha. Unfortunately, much of the expedition’s Egyptian command viewed their primary role as protecting the Prince from all harm rather than pursuing the expedition’s political and military goals. A descendant of French Huguenots who fled to America in 1685, Charles Chaillé-Long joined the pro-Union Maryland Infantry in 1862, achieving the rank of Captain and seeing action at Gettysburg and Harper’s Ferry. 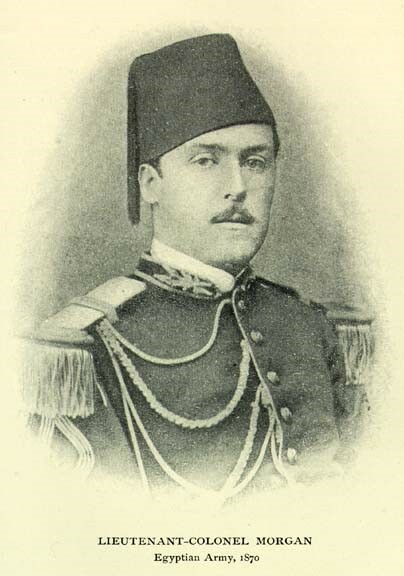 Chaillé-Long was commissioned as a Lieutenant-Colonel in the Egyptian Army. His fluency in French was a major asset, as French was commonly spoken by the royal and military elites in Egypt, while English speakers continually required interpreters. He was one of the few American officers to learn Arabic. Chaillé-Long served on Colonel Charles George Gordon’s staff in Equatoria Province, the southern-most region of the Sudan. His public criticism of Gordon, who had been seconded to Egyptian service, would eventually damage his reputation after Gordon achieved a type of Victorian sainthood following his death at the hands of Egyptian Mahdists in Khartoum (1885). In 1874, Chaillé-Long led a small party south on a secret mission to expand Ismail’s empire into tropical Africa. He succeeded in securing a treaty with the most powerful king in northern Uganda that made the latter a vassal of Egypt. On the return trip, Chaillé-Long was wounded in a two-hour battle with a rival king. When he reached Gordon’s headquarters in Equatoria he was a fearful sight; one eye closed and blackened, a gunshot wound to his nose, bearded, filthy and half-starved. It took some time for Chaillé-Long to convince Gordon it was really him. For his efforts he was eventually decorated and made a full colonel with the Turkish title of “Bey” (an honorific one step below “Pasha”). Further expeditions followed to the northeast Congo and Somalia. These took a serious toll on his health, leading to Chaillé-Long’s resignation in 1877. Chaillé-Long studied law after his US homecoming. He returned to Egypt in 1882 to practice law in the international courts in Alexandria. After US diplomats abandoned the Alexandria Consulate during the British bombardment later that year, Chaillé-Long took over as a temporary, unpaid consul and saved hundreds of Europeans from angry mobs of Egyptians who were massacring Europeans in the streets. He led 160 US sailors and marines as part of an effort to restore order in the city. In 1887, Chaillé-Long was appointed US consul general in Korea. In his later years he became bitter over what he saw as disproportionate attention given to British explorers in Africa over his own efforts. He was buried in Arlington National Cemetery in 1917. Alexander Macomb Mason Bey began his career in the US Navy before joining the Virginia Navy when the Civil War broke out in 1861. He was captured and sent to the Johnson’s Island prison camp in Ohio for the duration of the war. His relative James Murray Mason was one of the principals in the infamous Trent Affair that nearly brought the Union and Great Britain to blows. After his release, Mason saw action as a mercenary with the Chilean Navy against Spain in the Chincha Islands War. 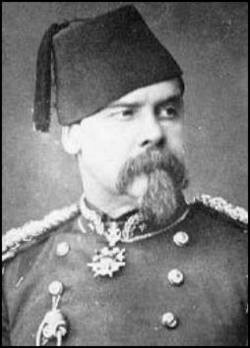 He joined the Egyptian army in 1870, where he worked as a military trainer and surveyor. He also explored western Uganda on behalf of the Khedive, being the first Westerner to visit the Semliki River, a tributary of the Nile. Unlike most of the Americans who left after the Abyssinian debacle, Mason stayed on in Egypt, becoming the governor of Massawa on the Red Sea coast and Egypt’s unofficial ambassador to Abyssinia. In 1883 he was the Egyptian representative on a British diplomatic mission to Emperor Yohannes to negotiate a peaceful withdrawal of all Egyptian garrisons on the Red Sea coast, though these bases were quickly taken over by the Italians, who had their own designs on Abyssinia. He stayed on in Cairo until he died in 1897 during a rare visit to his homeland. Born in Paris, Raleigh Colston seemed to live life under a black cloud. He did not arrive in his adoptive father’s native Virginia until he was 17. He managed to avoid an uncle’s determination that he should become a Presbyterian minister and enrolled at Virginia Military Institute (VMI). He taught there alongside Stonewall Jackson after graduation and commanded a guard of VMI cadets at the execution of abolitionist John Brown. When the war came, he was quickly made a Brigadier in the Confederate Army despite a lack of combat experience. He was strongly criticized for his performance at the Battle of Seven Pines, which was followed by a six-month illness. Nonetheless, with Jackson’s sponsorship, he was made a divisional commander until his performance at the Battle of Chancellorsville led to being relieved of his command by General Robert E. Lee, commander of the Army of Northern Virginia. 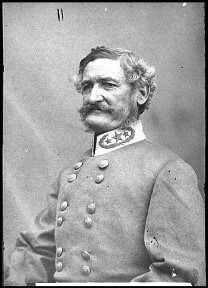 Later in the war, Colston served under General PGT Beauregard at the Siege of Petersburg. After the war, Colston joined the Egyptian Army when his attempts to establish a pair of military schools came to naught and his wife was confined to an insane asylum. In 1873, Ismail sent him on a camel-borne expedition to the ancient city of Baranis on the Red Sea to investigate the possibility of linking the Nile to the Red Sea by railroad. In 1874, Colston fell seriously ill during an expedition to the western Sudanese territory of Kordofan. Rather than return, he insisted on carrying on. Eventually he had to be carried on a camel litter, expecting death at any moment. He was eventually nursed back to health by the wife of a Sudanese soldier for whom he had once done a favor. Partially paralyzed as a result of his illness, he did not return to Cairo until two years after his departure. On his return to the US, Colston found limited work as a clerk and translator. Having used his Egyptian pay to support his wife and two children, he eventually found himself a penniless invalid living at the Confederate Soldiers’ Home in Richmond, where he died in 1896. A graduate of West Point, William McEntyre Dye led a Union brigade at the Battle of Prairie Grove, Arkansas and then participated in the Siege of Vicksburg. 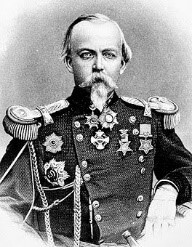 He commanded a brigade at the Battle of Brownsville in Texas, close to where Sudanese troops he would later command were fighting south of the border in Mexico. He distinguished himself while leading his regiment in an attack on Fort Morgan during the Battle of Mobile Bay. After the war, Dye joined the Egyptian Army as a colonel and served as assistant chief-of-staff to General Loring during the Abyssinian campaign. Dye was wounded at the Battle of Gura and returned to the US after being court-martialed for striking an Egyptian officer. He then served 11 years as chief military advisor to King Gojong of Korea. Dye learned Korean and wrote a military handbook in that language. Born on a Kentucky plantation, Charles W. Field graduated West Point and served in the American West under Colonel Albert Sidney Johnston in the 2nd US Cavalry. Joining the Confederate forces as a major in 1861, Field fought in Stonewall Jackson’s Valley Campaign and the Peninsula Campaign. His leg was badly damaged at Second Bull Run and never fully recovered. When he returned to the field as a major-general he suffered two more wounds in the Battle of the Wilderness. He led his division at Cold Harbor and the Siege of Petersburg before surrendering his command at Appomattox Court House. Field joined the Egyptian Army as a colonel of engineers, and later served as the Inspector General of the Army during its Abyssinian campaign. Field appears to have been one of the few Americans in the Egyptian Army to experience citizenship issues on his return as a consequence of having served in a foreign army. These were overcome when it was pointed out he had served on a private contract and had never pledged allegiance to a foreign head-of-state. An expert surveyor, Erasmus Sparrow Purdy worked with General Stone in surveying the Sonora and Baja regions of the American west before the war. He served during the Civil War as an officer in a New York infantry regiment. After joining the Egyptian army, Ismail sent Purdy on various missions to explore the far reaches of his expanding empire, including Darfur, northern Uganda and the Red Sea coast. Like many of the American officers, Purdy fell into debt and was harassed by his creditors. He died bankrupt in Egypt in 1881. Egypt’s Khedivial Geographical Society raised funds for a tombstone in the Protestant cemetery in Old Cairo. With time and neglect Purdy’s grave fell into disrepair until the year 2000, when some long-term American residents of Cairo raised the funds for a new 10-foot tall memorial. A ceremony was held, attended by a US Marine honor guard and US Major General Robert Wilson, who said “We regard Major Purdy as a pioneer in building American-Egyptian military relations,” a significant nod to the role of the forgotten American mercenaries. When the Civil War started, 15-year-old James Morris Morgan resigned from Annapolis and served as a midshipman in the Confederate flotilla on the Mississippi. He then helped work the naval batteries at Drewry’s Bluff in Virginia during the Peninsula campaign in 1862. He returned to sea with the Confederate gunboat Patrick Henry in the James River squadron. Morgan then served on the CSS McRae (a former pirate steamer converted to Confederate warship) until its destruction in the Battle for New Orleans. Morgan then joined the crew of the commerce raider CSS Georgia, which at one point became involved in a battle with Moroccan tribesmen while anchored off the Moroccan coast. Morgan described it as a “most narrow and fortunate escape for us slaveholders,” as they could expect to be murdered or sold into slavery themselves if captured. During the war Morgan’s two older brothers died while serving as officers under Stonewall Jackson. Morgan did not participate in any significant campaigns in Egypt and seems to have spent most of his time dueling and chasing actresses. A forbidden flirtation with a Circassian princess nearly cost him his life. After returning to the US, Morgan was hired by General Stone as an engineer on the Statue of Liberty project. He later became the US Consul for Australasia. He described his life in a highly entertaining account, Recollections of a Rebel Reefer, published in 1917. By the time of his death in 1928 Morgan was the last remaining American veteran of the Egyptian Army. Henry Hopkins Sibley was a graduate of West Point and was decorated for bravery in the Mexican-American War. When the Civil War began, Sibley was fighting the Navajo in New Mexico. He resigned his commission to join the Confederate forces and organized a brigade of Texans. Sibley’s greatest moment came when he led this brigade west in an attempt to capture the Colorado gold mines and reach the Pacific coast to establish a Confederate port in California. Following a string of victories, the climactic battle of the campaign was fought in 1862 at the Glorieta Pass in the New Mexico territory. Sibley’s men won a tactical victory by driving the Federal forces back through the pass but lost all their supply train in the process, forcing a withdrawal into Texas. This brought an end to Confederate hopes of extending their territory to the Pacific. Taking command of the Arizona Brigade in Louisiana, Sibley developed an unfortunate reputation for failing to follow orders and alcohol abuse that led to his court-martial in 1863. Sibley was recruited by Mott after the war and served as the commander of the Egyptian artillery for three years. 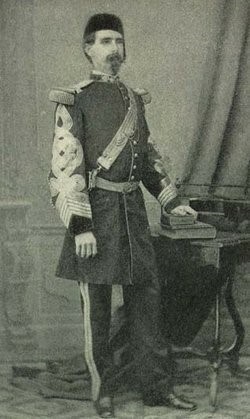 Sibley helped supervise the construction of Egypt’s coastal fortifications until problems with alcohol returned and he was dismissed from Egyptian service in 1873. The man who almost seized California for the Confederacy died in poverty and was buried in Fredericksburg Confederate Cemetery. Though largely forgotten by history, Sibley’s character made a brief appearance in the spaghetti western The Good, the Bad and the Ugly, which is set in the midst of Sibley’s New Mexico campaign. Beverley Kennon Junior’s father, Commodore Beverley Kennon, fought in the War of 1812 and the Second Barbary War. The Governor Moore was an expropriated commercial paddle-wheeler turned into a warship by the addition of guns, iron rails fitted as a ram and cotton bales to protect its boilers. Kennon took command of this hybrid ship without pay and fought it in the furious April 1862 battle just south of New Orleans. At one point the Governor Moore was too close to the USS Varuna to use its bow gun, so Kennon ordered the gun to fire twice through the Governor Moore’s bow to sink the Union ship. By the end of the battle, most of Kennon’s ship was destroyed and 64 of her crew were dead or dying. The ship was run aground and set on fire, but Kennon was captured and endured three years of brutal captivity in the north. After joining the Egyptian Army, Kennon devised a brilliant system of coastal defense. Instead of constructing large forts to defend Alexandria, Kennon proposed hiding single gun emplacements along the coast with interlocking fields of fire. The guns would be hidden in the sand hills, raised by a hydraulic system of Kennon’s own invention before taking a shot and disappearing again into the sand bank for reloading. Part of Kennon’s defensive works involved a modern wire-guided torpedo designed by Buffalo New York native John Lay, who began designing torpedoes in the Civil War. In 1882 the Arab officers and men of the Egyptian Army led by Colonel Ahmad ‘Urabi revolted against the Turko-Circassian aristocracy. The ensuing chaos put control of the newly-built Suez Canal in jeopardy and European lives at risk from murderous mobs in Alexandria. British and French warships soon arrived off Alexandria, where they began a bombardment of the city. 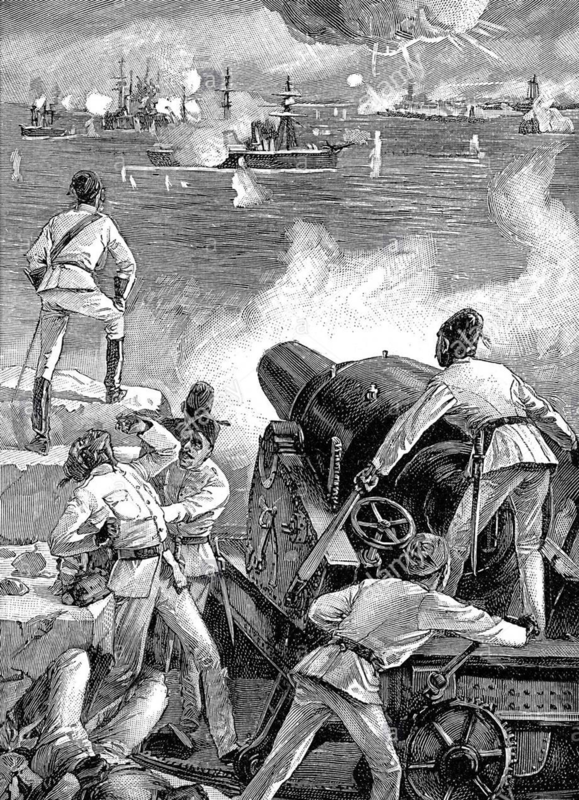 Despite putting up a good fight, the Egyptian coastal batteries were quickly destroyed by British firepower and British troops were soon investing Egypt. Kennon had finished a working prototype of the defensive system before being told the Khedive’s finances could not afford the completion of the system. Implementation of Kennon’s plan could have easily changed the course of Egyptian history (and that of the Mid-East) by giving Colonel ‘Urabi’s forces the means of fending off the British invaders, who would remain for 76 years. When the British troops reached the Citadel in Cairo, they destroyed all the maps and charts so painfully prepared by the American officers. The legacy of the American military presence in Egypt was thus eliminated in Egypt while the triumphs and errors of the Civil War veterans in Ismail’s African empire were fated to be forgotten in their US homeland. Al-Qaeda Cell on Trial as Ethiopia becomes a Religious Battleground? Ten Somalis and one Kenyan are currently under trial in Addis Ababa for their alleged involvement in an al-Qaeda bombing plot after weapons and training manuals were seized in the Bale region of southeastern Ethiopia last December. The Kenyan, Hassan Jarsoo, has admitted his role in the alleged plot, but the others, who allegedly include several members of the army of Somalia’s Transitional Federal Government, have denied their involvement. Six of the defendants are being tried in absentia (Walta Info Online [Addis Ababa], May 20; Africa Review [Nairobi], May 22; AFP, May 18). Ethiopia is one of the earliest homes of both Christianity and Islam, with its 85 million people being roughly 60% Christian and 30% Muslim. These communities have traditionally lived in harmony, but in recent years Ethiopia’s Orthodox Christians and Sufi-based Muslims have come under destabilizing pressure from external sources, primarily from American backed Christian evangelists and Saudi/Kuwaiti backed Salafists. Both of these trends have caused dissension in the religious communities by describing traditional Ethiopian forms of worship as deviations if not outright heresy and insisting that their adherents must convert to these new, more fundamentalist forms of worship. Ill-considered intervention by the central government has only inflamed the situation, and the result has been a growing wave of religious violence in a nation that has prided itself on religious tolerance. Islam arrived in Ethiopia even before it had firmly established itself in Arabia, as the Prophet Muhammad urged his persecuted followers to flee Mecca in 615 and take refuge in northern Ethiopia, where he promised they would find protection from its just king and his Christian followers. While many returned when Mecca became safe for Muslims, there is some evidence that others stayed in Ethiopia, founding the first Muslim community in Africa. The first muezzin (prayer-caller) in Islam was the ethnic Ethiopian Bilal ibn Rabah (a.k.a. Bilal al-Habashi), one of the Prophet’s closest companions. The Ethiopian city of Harar is regarded in some traditions as the “fourth-holiest city in Islam,” with mosques dating back to the 10th century and over 100 shrines. Ethiopian Prime Minister Meles Zenawi told parliament in April that the government was “observing tell-tale signs of [Islamic] extremism. We should nip this scourge in the bud” (Reuters, May 10). In response to fears of an incipient Salafist movement to establish an Islamic state in Ethiopia, the government is attempting to make a little-known and non-threatening Islamic sect known as al-Ahbash the dominant form of Islam in the country, a solution that has inflamed Sufis and Salafists alike. The Ahbash movement was founded by Abdullah al-Harari (a.k.a. Abdullah al-Habashi, 1910-2008), a Harari scholar of Islam whose views were regarded locally as divisive, resulting in his being forced to leave for Lebanon in 1950. Al-Harari founded al-Ahbash, also known as the Association of Islamic Charitable Projects, in the 1980s. Ethiopian Salafists have complained the government is importing Ahbash imams from Lebanon to teach local Muslims that Salafism is a non-Muslim movement (OnIslam.com, April 29). The leading Islamic religious authority in Ethiopia is the Islamic Affairs Supreme Council (IASC). Salafists no longer participate in the Council, which is in the process of having its representatives replaced by government appointed members of the Ahbash sect. Even authorities such as Dr. Ali Jum`ah, Grand Mufti of Egypt and Professor of the Principles of Islamic Jurisprudence at Cairo’s al-Azhar University, charge the movement with having “strange deviant views that have never been expressed by any Muslim sect, group or movement,” including the free intermingling of the sexes, unrestricted cooperation with non-Muslims and the issuing of fatwa-s that contradict the Koran and Sunnah. Salafists and orthodox Sunni scholars also charge al-Ahbash with allowing intercession with the dead (saint-worship), overlooking the need to observe the five pillars of Islam, declaring Salafist-favored scholars such as Ibn Taymiyah, Muhammad ibn Abd al-Wahhab and Sayyid Qutb to be kuffar (infidels) and obscuring their true beliefs by failing to commit them to print (OnIslam.net, April 22). Seven Muslims were killed and scores wounded by Ethiopian police in late April when security forces surrounded a mosque in the Oromia Region in an attempt to arrest Salafist Shaykh Su’ud Aman following protests against the government’s efforts to impose Ahbashism (OnIslam.com, April 29; VOA, May 21). As in many other parts of the Islamic world, Saudi Arabia and other Gulf states have built numerous schools in underserved regions while Ethiopian workers have found employment in the Arabian Peninsula, where they have been exposed to highly conservative forms of Islam that differ greatly from those traditionally practiced at home. The religiously-inclined can find employment in Saudi-sponsored mosques in Ethiopia after taking advantage of generous scholarships to study Salafist Islam in Saudi Arabia. Local imams suffer from an educational and financial disadvantage in countering the Salafist scholars. The introduction of non-Orthodox Christianity by Protestant missionaries has also created often violent dissension in both the Christian and Muslim communities. Evangelical Protestant churches and the homes of some evangelical Christians were burned down by in the town of Asendabo in southwest Ethiopia in March, 2011. Residents of the dominantly Muslim region were incensed by rumors that members of the Pentecostal churches were using pages of the Koran as toilet paper (Radio Netherlands Worldwide Africa, March 20, 2011). Thousands were displaced in violence Prime Minister Zenawi blamed on a sect known as Kawarja. In Bale Region, a group of 17 Ethiopian Christian students were assaulted last year after they attempted to distribute Bibles to local Muslims (Ethiopian Review, March 2, 2011). There have also been Muslim attacks against evangelical Christians in the southern Ethiopian city of Besheno in November, 2010 and May 2011 (AsiaNews, May 2, 2011). 1. Wikileaks, U.S. Embassy Cable, 09ADDISABABA1675, July 15, 2009; U.S. Embassy Cable, 08ADDISABABA3230, November 26, 2008. The books in question were The Great Theft: Wrestling Islam from the Extremists (2005), and The Place of Tolerance in Islam (2002). 2. Wikileaks, U.S. Embassy Cable, 08ADDISABABA3230, November 26, 2008. 3. Wikleaks, U.S. Embassy Cable 09ADDISABABA1672, July 15, 2009. 4. Wikileaks, U.S. Embassy Cable, 09ADDISABABA1675, July 15, 2009. Political reverberations from the revolutions in Tunisia and Egypt continue to sweep through the Horn of Africa, which has already witnessed demonstrations against the Transitional Federal Government and its Islamist opponents in Somalia (see Terrorism Monitor Briefs, February 17). Now militants belonging to Ethiopia’s Oromo Liberation Front (OLF) have called for all of Ethiopia’s ethnic and religious groups to emulate the Tunisian and Egyptian revolts and unite in deposing the Tigrayan-dominated government of Prime Minister Meles Zenawi, leader of the Tigrayan People’s Liberation Front, the major element of the ruling Ethiopian People’s Revolutionary Democratic Front (EPRDF) coalition. In a statement broadcast in both Afan Oromo and Amharic, the OLF maintained that only a revolution in the streets could command the attention of the West: “Until [Addis Ababa] becomes the next Tunis or Cairo, their ears will not listen,” though “most of the superpower countries, the hitherto supporters and handlers of the tyrannical regimes, were forced to quickly abandon their darlings and side with the people in revolt.” Most importantly, the Oromo must unite with Ethiopia’s Amharic speakers to provide a long-term solution to the country’s ills (Jimma Times, February 27). The Oromo are the largest single ethnic group in Ethiopia and dwell principally in central and southern Ethiopia, though there is a high degree of social integration with Ethiopia’s Amharic-speaking peoples, the traditional rulers of the nation until 1991. The Oromo are religiously diverse, with members of the ethnic group following Islam, Christianity and traditional religions, but not all Oromo opposition leaders and parties agree on the necessity of a revolution. In recent days, a joint operation along the border by Ethiopian and Kenyan military forces that began last November is reported to have resulted in the arrest of at least 120 OLF fighters and the seizure of a quantity of arms, grenades and missiles. The existence of a cross-border Oromo community is reported to have complicated efforts to identify OLF members; according to a local Kenyan provincial commissioner, “These people speak the local dialect and it may be hard to distinguish them from the locals but the locals themselves are volunteering information that will lead to their arrest.” The operation will continue to search for other OLF members (Sudan Tribune, February 26). The OLF began an armed struggle for Oromo self-determination and local autonomy from the Amhara monarchy in 1973. After dropping out of the coalition government formed after the conclusion of the Ethiopian civil war and the fall of the communist Derg regime of Mengistu Haile Mariam in 1991, the OLF then took up arms against the new Tigrayan-dominated government. Addis Ababa classifies the OLF as a terrorist organization and has accused it of being responsible for a series of bombings in Addis Ababa in 2008, a claim denied by the OLF (see the OLF statement published in the Sudan Tribune, May 29, 2008). 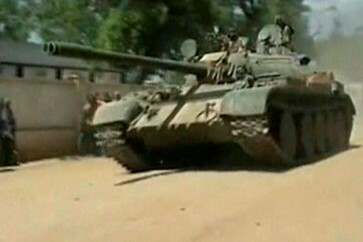 Despite assertions by Ethiopian authorities that the military capabilities of the OLF and its armed wing, the Oromo Liberation Army (OLA), have been much diminished by constant pressure from government security services, the movement recently claimed that a special unit of the OLA operating in the OLF’s so-called “Eastern Zone” raided and destroyed a government military base in Kombolcha, killing 19 soldiers and injuring 25 others (Voice of Oromo Liberation Radio, February 25; OLF News, February 26; for OLF military capabilities, see Militant Leadership Monitor Briefs, January 29, 2010). The attack and the alleged casualties have not been confirmed by government sources. Kombolcha is 12km from the commercial center of Harar. The OLA has also claimed responsibility for the February assassination of a government intelligence official in the Eastern Oromia district who was accused of harassing members of the local Oromo community. An OLA statement warned: “Those who continue to be part of the TPLF killing machine will face the same death penalty unless they refrain from such evil acts” (OLF News, February 6; Jimma Times, February 9). The ongoing destruction of Somalia by clan warfare, sectarian conflict and foreign intervention continues to dominate international headlines; yet across Somalia’s border with Ethiopia there is an ongoing conflict involving ethnic Somalis in a remote and inhospitable region that has had a negligible amount of media coverage. The decades-old struggle between the Ethiopian government and the Somalis of Ethiopia’s Somali Region (known as Haraghe Province until the administrative reforms of 1995) is one of brutal attacks and retaliations conducted out of sight of foreign media, which is banned from the region. Though it is best known as the Ogaden conflict, after the ethnic-Somali Ogadeni clan that leads the rebellion, ethnic-Somalis actually fight on both sides of the dispute. The Somali Region is the second largest of Ethiopia’s nine regions and is home to over four million people. 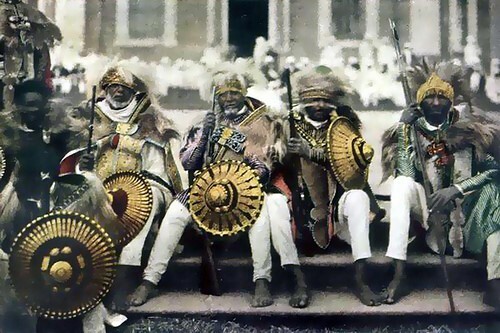 Since its conquest by imperial Ethiopia in the nineteenth century, the region has experienced very little in the way of development or improvement. In addition, it has remained the focus of Somali nationalists who seek the creation of a “Greater Somalia” incorporating Somalia, Somaliland, Djibouti, the Somali Region of Ethiopia and the ethnic-Somali northeastern districts of Kenya. Pursuit of this goal led to the Ogaden War of 1977-78, when Somali dictator Siad Barre committed four mechanized brigades to support armed Somali separatists in the region. The conflict quickly grew out of hand, with airlifts of Soviet military equipment and 10,000 Cuban regulars tipping the scales in favor of the Marxist Derg regime (1975-1987) in Addis Ababa. Though Ethiopia eventually inflicted a devastating defeat on the Somali military, the dominant theme in its policy in the Somali Region and towards Somalia proper has been the avoidance of any repetition of such a costly and threatening episode. Since the 1991 overthrow of the Derg, Ethiopia has been ruled by the Ethiopian Peoples’ Revolutionary Democratic Front (EPRDF), an umbrella group dominated by the Tigray People’s Liberation Front (TPLF) under Prime Minister Meles Zenawi. 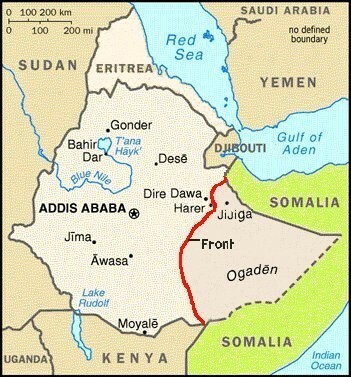 Even the name of Ethiopia’s Somali region is in dispute – Ethiopia’s official name is “the Somali Region,” though it also calls it the “Fifth Region”; Ogadeni clan Somalis call it “the Ogaden region” (a name rejected by the non-Ogadeni Somali clans of the region); and the pre-revolution Somali government referred to it as “Western Somalia.” The leader of the Ogaden National Liberation Front (ONLF), Admiral Muhammad Omar Osman, rejects the idea that the name “Ogaden” implies the superiority of that clan; “This is the internationally recognized name, which is shown on world maps. The Front sees no use in creating a new name for the region and then introducing it to the world anew. The former Somali government called the region Western Somalia, but few people in the region know this name.” Nonetheless, Osman says it is possible the name might still be changed “after liberation” (Asharq al-Awsat, October 12, 2009). 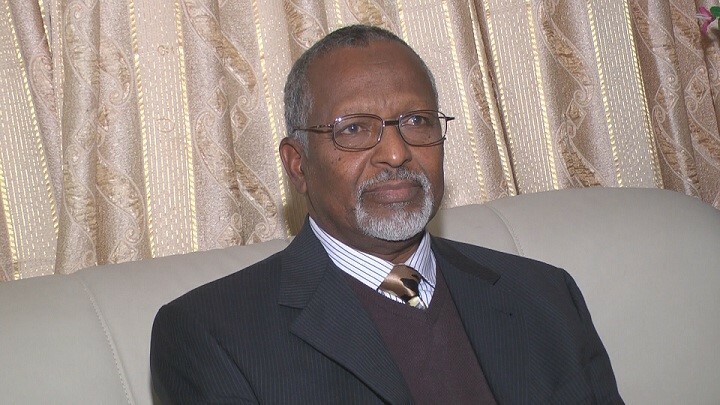 Now 70-years-old, Muhammad Omar Osman has led the ONLF since his appointment at a party congress in 1998. As a member of the Ogadeni clan, he was born within the borders of Ethiopia, but by the time he was a teenager he was attending school in the Somali capital, Mogadishu. Osman turned to a military career and pursued military studies in Egypt and the Soviet Union. As an officer of Somalia’s armed forces, Osman assumed a position within Siad Barre’s Somali Revolutionary Socialist Party, the Soviet-inspired Marxist-Leninist political wing of Barre’s military regime. Founded in 1976, the party’s leadership was dominated by military officers and Osman eventually rose to a prominent position in the party’s five-member Politburo (Bartamaha, October 12, 2009). Loyalty to the Siad Barre regime resulted in Osman’s appointment to Admiral of Somalia’s tiny navy of Soviet-built fast-attack craft. After the overthrow of the Siad Barre regime, Osman returned to his homeland, where he joined the ONLF. Clan Militia or National Liberation Movement? The ONLF was formed in 1984 after the collapse of the separatist Western Somali Liberation Front (WSLF). The movement entered into politics in 1991 with some initial success, though the rise of the rival and more broadly-based Ethiopian-Somali Democratic League (later the Somali People’s Democratic Party) and the ONLF’s open policy of secession created strong opposition from Addis Ababa and drew support away from the ONLF, which then began a program of armed resistance to the Ethiopian state in 1994. Besides attacks on Ethiopian troops, the movement has been blamed for a series of bombings in Addis Ababa and the regional capital of Jijiga, leading the central government to designate the ONLF as a terrorist organization with alleged (but so far unsubstantiated) ties to al-Qaeda. Despite Ethiopia’s role as an American military ally, the Ethiopian regime’s characterization of the ONLF and its activities as “terrorism” has failed to bring about a U.S. or EU designation of the ONLF as a terrorist organization. Unlike the region’s Islamic Nasrullah resistance movement of the 1960s, the ONLF is notably secular and nationalist in orientation, though there remains a subtext of tension between the Christian rulers of Ethiopia and the Muslim clans of the Ogaden region. Some reports maintain that the ONLF portrays itself as a secular movement for external consumption, but increasingly relies on an emphasis on Muslim identity and calls for jihad in its recruiting. In discussions with the Arab press, Osman has not hesitated to describe the Ogaden issue as “an Arab-Islamic cause because the Ogaden people are an Arab Muslim people” (Asharq al-Awsat, October 12, 2009). Osman calls for a “free referendum” on independence, consolidation with Somalia or a continued presence within Ethiopia for the Somali Region, though he says negotiations with the Ethiopian government are possible, so long as they take place in the presence of a neutral third party in a neutral location (Asharq al-Awsat, October 12, 2009). Despite being personally based in Eritrea amidst widespread allegations of Eritrean military training and support for the ONLF, Osman denies any suggestion that his movement acts as a proxy in the ongoing rivalry between the leaders of Eritrea and Ethiopia; “The Ogaden Region and Eritrea were under Ethiopian occupation, and we began the war before Eritrea was liberated and also before the Eritrean-Ethiopian conflict. There is no connection between this conflict and the ONLF struggle” (Asharq al-Awsat, October 12, 2009). Many local Somalis not belonging to the Ogaden clan (a sub-clan of the Darod) reject the ONLF as an attempt to enforce Ogadeni rule in the region. Pro-government clan militias have been formed by the government (sometimes through coercion) from members of the Isaaq, Dir and non-Ogadeni Darod clans to combat the ONLF. There were reports of heavy fighting between the ONLF and clan militias supported by government troops in late April (Jimma Times, April 30; Ogaden Online, April 24). 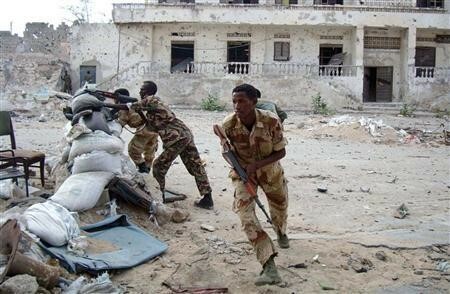 The poorly trained and equipped clan militias typically take heavy casualties in clashes with the ONLF. Without outside observers it is extremely difficult to assess the accuracy of battle reports from either side. For example, ONLF forces claimed a major success last year in capturing the town of Mustahil, killing 100 government soldiers while capturing another 50. A government spokesman termed the claim “absolutely false” and maintained ONLF forces were on the run (Shabelle Media Networks, March 8, 2009; Garowe Online, March 9, 2009; Somaliweyn, March 10, 2009). Only rarely do accounts bear any similarity to each other; more often one side will claim victory and the infliction of great losses on the enemy while the other side will respond with a statement saying they know nothing of any such encounter. The ONLF frequently refers to military actions undertaken by its “Special Forces” units, such as the Dufaan commando or the Gorgor (Eagle) unit (Mareeg Online, March 7, 2009). The latter was reported to have captured the Malqaqa garrison along the road between Jijiga and Harar in mid-May, killing 94 soldiers, freeing 50 civilian detainees and seizing 192 light and heavy machine guns (Ogaden Online, May 17). As usual, these figures are impossible to verify. Though the arid expanses of Ethiopia’s Somali Region offer little more economic activity than herding and other agricultural pursuits, there has been a great deal of recent speculation regarding potentially exploitable mineral deposits and oil and gas reserves. Chinese, Malaysian, Indian, Canadian and Swedish exploration companies have all become active in the region under government protection after concluding deals in Addis Ababa without local consultation. The ONLF has advised foreign exploration companies that the government does not control the region and their security guarantees are worthless (Afrol News, November 14, 2006). The movement backed up these warnings with a major attack on a Chinese-managed oil exploration site at Obala in the northern Ogaden region in April 2007 that killed 65 Ethiopian soldiers and nine Chinese oil workers. It also resulted in the short-term abduction of seven Chinese oil workers (BBC, April 14, 2007; ONLF Communiqué, April 24, 2007). The scale of the attack led to speculation that Eritrean advisors and weapons had been part of the operation. According to Osman; “If the occupation authorities exploit these resources, they will not use them to develop the region. Rather, they will use them to destroy the region and repress the people” (Asharq al-Awsat, October 12, 2009). Further warnings to foreign companies were issued last month (Shabelle Media Network, April 25). Though the Obala operation finally gained the movement international attention, it served to justify an extremely severe crackdown on the region by Ethiopian National Defense Force (ENDF) troops operating under the concept of collective punishment. Though outside observers were banned during the operation, refugees and local informants of human rights organizations reported summary executions of civilians, destruction of villages, torture and blockades of food and humanitarian aid. In what is clearly a “dirty war,” ONLF forces have been accused of similar human rights abuses in dealing with the civilian population. Internal disputes within the party came to a head with the January 2009 killing of the head of the ONLF’s Planning and Research Department, Dr. Muhammad Sirad Dolal. A committee of ONLF members produced a report on Muhammad Sirad Dolal’s murder in March. The report suggested that cronyism and tribal favoritism began to permeate the movement’s leadership after Muhammad Omar Osman became ONLF Chairman in 1998. Differences arose between the party leader and Muhammad Sirad Dolal after the latter opposed the Chairman’s attempt to remove Muhammad Abdi Yasin from his post as Liason for the Diaspora Community, allegedly for reasons based on tribal animosity. In 2005 Osman claimed Dr. Dolal was preparing to defect to the Ethiopian government and issued orders that he was to be killed, orders that were subsequently ignored by fighters who did not believe the Chairman’s allegations. As the party began to split over the growing animosity between the two, Osman dismissed Dr. Dolal from the movement’s leadership. 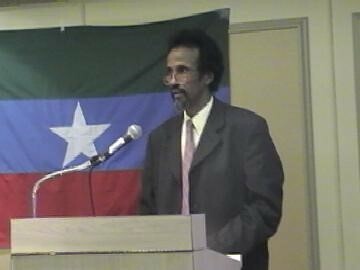 An unsuccessful assassination attempt on Dr. Dolal followed at an ONLF-dominated refugee camp in Kenya in 2008. Between November 2008 and January 2009 there were a number of clashes between the Chairman’s supporters and supporters of Dr. Dolal. Eventually Osman sent three commando teams to kill Dr. Dolal after informing them Dolal was an Ethiopian agent. After the successful conclusion of their mission on January 17, 2009 it was decided to let local government security forces take credit for the killing (Raxanreeb.com, March 23; Sudan Tribune, March 16, 2009). Dr. Dolal’s daughter has openly accused Muhammad Omar Osman and party leaders Abdirahman Mahdi Madayi, Muhammad Ismail and Adani Hiromooge of organizing his death (Raxanreeb.com, January 11). While it appears Osman’s supporters had little input to this report, it nevertheless provides background for the subsequent split in the movement. Regardless of who was responsible, the death of Muhammad Sirad Dolal divided the ONLF. A senior movement member, Abdiwali Hussein Gas, announced the appointment of a new ONLF chairman, Salahudin Ma’ow, with the promise that the new leader would bring Osman to account for breaking up the ONLF (Jimma Times, March 3, 2009). For his part, Osman denies that any split has taken place in the movement, suggesting those who mention it are those who would like to see such a split occur (Asharq al-Awsat, October 12, 2009). A smaller Somali movement, the United Western Somali Liberation Front (UWSLF, a local successor group to al-Itihad al-Islami) has finally capitulated to the Ethiopian government after 18 years of sporadic armed struggle (Reuters, April 9; Raxanreeb.com, May 7). Under its leader, Shaykh Ibrahim Muhammad Dheere, the UWSLF will now operate as a peaceful political movement within the terms of the Ethiopian constitution (Walta Information Center, May 6). The ONLF has criticized Ethiopian attempts to represent this event as the end of hostilities in the region (Jimma Times, May 7). Amidst rumors of new challenges to his leadership from within the ONLF, Muhammad Omar Osman, the Admiral turned rebel leader, faces major difficulties in sustaining his movement’s struggle in the face of a deeply divided membership, local opposition, an unsympathetic public image, unrestrained retribution from the Ethiopian military, a lack of foreign support from any quarter other than Eritrea and general international opposition to violent movements even rumored to be linked to radical Islamists. A new wave of heavy fighting broke out in Mogadishu on April 19 that lasted for over 48 hours and left more than 80 dead. More residents continue to pour out of the city past Ethiopian tanks awaiting further attacks from the Islamists (al-Jazeera, April 21). Numerous eyewitness reports claim that Ethiopian troops entered the al-Hidaya mosque in Mogadishu, where they killed 11 Somali civilians, including a number of preachers and the imam of the mosque, Shaykh Said Yahya. A further 10 civilians were killed outside the mosque. The preachers were members of the Tablighi Jamaat, a normally non-political Islamic missionary order that originated in India and has spread to East Africa, among other places. The Tablighis are not known to have played any part in the Islamist insurgency in Mogadishu. One of the surviving preachers, Shaykh Muhammad, claimed: “We believe the reason behind the attack was a fight against Islam, and to completely destroy areas where it is active, and make it stagnant” (Radio Shabelle, April 24). In Washington on an official visit at the time, Somalia’s interim President Abdullahi Yusuf described Ethiopian clashes with “terrorist groups named al-Shabaab and al-Qaeda,” but claimed “there is no incident where soldiers entered a mosque and slaughtered the people inside” (Garowe Online, April 25). A spokesman for the Ethiopian Foreign Ministry stated that the account of Ethiopian troops killing civilians at the mosque was “a completely fabricated story designed to blackmail the Ethiopian army, one of the most disciplined forces anywhere in the world” (Guardian, April 25). The throats of seven of the victims were slit, which Amnesty International described as “a form of extra-judicial execution practiced by Ethiopian forces in Somalia” (AI Press Release, April 23). A later statement from the Ethiopian Foreign Ministry eventually acknowledged the killings had taken place, but pinned the blame on the Islamist Shabaab militia: “The cutting of the throats of even enemies and mutilating bodies is not in the tradition of Ethiopian troops. On the other hand, the al-Shabaab [Islamist] terrorists have never been ashamed of these types of atrocities” (AFP, April 25). A December 2007 statement from Mogadishu’s dominant Hawiye clan deplored a number of “grave violations of human rights” committed by Ethiopian occupation troops, including “throat slitting” (Appeal by Hawiye Council in London, December 12, 2007). Forty-one Quranic students in the mosque ranging in age from nine to 18 were taken away by Ethiopian troops and eventually transferred to the local police, where they were being investigated for terrorist activities (Shabelle Media Network, April 26); 37 of the students were released on April 24. The massacre at al-Hidaya mosque has thrown the peace talks scheduled to begin in Djibouti on May 10 into doubt. A number of opposition leaders already in Djibouti, including Shaykh Sharif Shaykh Ahmed, are reported to have left Djibouti after receiving reports of the mosque incident. In its efforts to expel an Islamist government and capture a handful of inactive al-Qaeda suspects in Somalia, the United States has risked its political reputation in the region through a series of unpopular measures. These include backing an unsuccessful attempt by warlords to take over the country, several ineffective air raids, and finally, the financing of an unpopular Ethiopian military intervention. As African Union peacekeepers struggle to restore stability in the capital of Mogadishu, China has stepped in to sign the first oil exploration deal negotiated by Somalia’s new government. The agreement is the first of its kind since the overthrow of the Siad Barre regime in 1991 began a long period of political chaos in the strategically important nation. The Somalia deal is part of a decades-long Chinese campaign to engage Africa through investment, development aid, “soft loans,” arms sales and technology transfers. The European Union recently warned China that it would not participate in any debt-relief projects involving China’s generous “soft-loans” in Africa (Reuters, July 30). Last month a deal was reached between Somali President Abdullahi Yusuf Ahmad, the China National Offshore Oil Corporation (CNOOC) and China International Oil and Gas (CIOG) to begin oil exploration in the Mudug region of the semi-autonomous state of Puntland (northeast Somalia) (Financial Times, July 17). Somalia’s Transitional Federal Government (TFG), which has yet to secure its rule, is to receive 51 percent of the potential revenues under the deal. Somali President Abdullahi Yusuf (a native of Puntland) appears to have negotiated the deal in concert with Puntland officials but without the knowledge of the Prime Minister, Ali Muhammad Gedi, who is still working on legislation governing the oil industry and production-sharing agreements. Gedi insists that “in order to protect the wealth of the country and the interests of the Somali people, we cannot operate without a regulatory body, without rules and regulations” (Financial Times, July 17). The agreement with China may become an important test of the authority of the transitional government. China has effectively pre-empted the return of Western oil interests to Somalia, though it is unclear how the Chinese project may be affected by the passage of a new national oil bill. Somali negotiators assured the Chinese firms that new legislation would have no impact on exploration work due to begin in September (Shabelle Media Network, July 17). Last November, Beijing hosted an important summit meeting between Chinese leaders and representatives of 48 African countries. The African delegates gave unanimous support to a declaration endorsing a one-China policy and “China’s peaceful reunification” . China in turn announced a $5 billion African development fund (administered by China’s Eximbank), with a promise of $15 billion more in aid and debt forgiveness to come. In exchange for secure energy supplies, China is also offering barrier-free access to Chinese markets, something Africans have been unable to obtain from the United States or the EU. China continues to expand its operations in the Sudan, its most successful foreign energy project to date. Oil from southern Sudan currently supplies 10 percent of China’s imported energy needs. Chinese and Malaysian companies operating as a joint venture (with a minority Sudanese share) stepped up to take over the exploitation of Sudan’s vast oil reserves after international pressure forced out the Canadian Talisman Corporation. The China National Petroleum Corporation (CNPC) recently announced the acquisition of a 40 percent share in a major exploration site off the Sudanese Red Sea coast. A 1997 embargo prevents U.S. companies from operating in the Sudan. 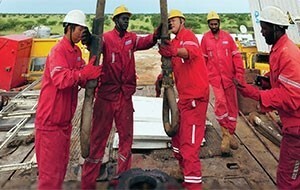 The Sudanese/Swiss ABCO Corporation claims that preliminary drilling in Darfur revealed “abundant” reserves of oil. These reserves have yet to be confirmed, but it appears that the rights may have already passed into Chinese hands (AlertNet, June 15, 2005; Guardian, June 10, 2005). China and Malaysia, partners in the Sudan, are trying to replicate their Sudanese success in the Ogaden region of Ethiopia. As a demonstration of goodwill—and to increase the incentives for cooperation—China and Ethiopia signed a debt relief agreement in May worth $18.5 million (Xinhua, May 30). In addition, a new convention center for the African Union headquarters in Addis Ababa is being built with substantial Chinese assistance. In Niger the CNPC (already active in two other concessions) appears to be in the lead for the sole rights to the promising Agadem concession, to be awarded sometime this month. With financial support from the Chinese government, CNPC is offering to build a refinery and a pipeline in exchange for the rights, a commitment even Western oil giants like Exxon have shied away from. A Tuareg-based rebel movement in the resource rich north has declared Chinese oil and uranium operations “unwelcome” while accusing China of supplying the Niger army with weapons to pacify the region. Rebels attacked an armed supply convoy heading to a CNPC exploration camp in July, killing four soldiers (Reuters, July 31). Last year, the CNOOC moved into territory previously dominated by major Western oil companies in the Niger Delta, paying $2.7 billion for a 45 percent share in an offshore oilfield expected to go into production in 2008 (Reuters, April 26, 2006). China is building $4 billion worth of oil facilities and other infrastructure in return for access to other promising Nigerian oil-fields, including the untapped inland Chad basin (BBC, April 26, 2006). With a growing insurgency in the oil-rich Niger Delta threatening Nigeria’s oil industry, China has stepped in to supply weapons, patrol boats and other military equipment. Beijing does not share Washington’s reluctance to supply such hardware to a Nigerian military accused of corruption and human rights violations (Financial Times, February 27). The insurgents claim that Chinese, Dutch and U.S. resource companies fail to hire local labor and are devastating the local economy and environment through unchecked pollution. The world’s eighth largest oil exporter, Nigeria is also a major market for Chinese exports. Beijing has been wooing oil-rich Angola through promises of aid and development. Its promise of $2 billion in soft loans brought a guarantee of uninterrupted oil supplies to China and offshore exploration rights for CNPC while enabling Angola to avoid Western pressure to restructure a corrupt and inefficient economy. As China intensifies its economic engagement with Africa, the United States has been steadily increasing its military presence in Africa, supplying arms, training troops and opening new bases for U.S. personnel. Efforts such as the Trans-Saharan Counterterrorism Initiative have brought U.S. forces into many countries for the first time as part of the global effort against al-Qaeda. The creation last February of AFRICOM, a new U.S. regional combatant command for Africa, reflects Washington’s new interest in the area. Despite the anti-terrorism rhetoric, it appears that the main function of AFRICOM will be to secure U.S. energy supplies in a region that is expected to provide a growing share of the United States’ future energy needs. Ironically, U.S. arms and military training provided under the guise of “counter-terrorism assistance” may ultimately provide Chinese oil interests with the security they need to carry out operations in high-risk areas. An Ethiopian army financed and equipped by the United States for use against “Al-Qaeda terrorists in Somalia” is now being used to protect Chinese oil exploration efforts in the Ogaden region through military operations against ONLF rebels and punitive attacks on ethnic-Somali civilians. So far, a visible disinterest in tying resource development contracts to social or economic reforms has aided China in securing its energy future in Africa. To be fair, this pattern of tolerance for corruption in regimes with desirable natural resources was set long ago by Western corporations and governments. China still employs the rhetoric of anti-colonialism in its relations with Africa, but many Africans are beginning to see China as an exploitive major power supporting corrupt regimes in the same manner as the former Western imperial powers. While China is taking some small steps to correct this impression, problems will persist unless Africans see immediate benefits from the Chinese presence, particularly in the field of employment. China’s success in presenting itself to the Third World as “the largest developing country” will eventually have limited currency if its business operations become indistinguishable from Western corporations. 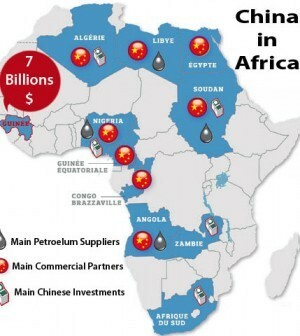 In the meantime, China’s rivalry with the West for control of Africa’s oil is certain to intensify. See the full text of the Declaration of the Beijing Summit of the Forum on China-Africa Cooperation, available online at: english.focacsummit.org/2006-11/16/content_6586.htm. On June 14, Somalia’s National Reconciliation Conference (NRC) was postponed for the second time. It is now possible that the conference will never be held. The NRC has been long viewed by the United States, the European Union and others as Somalia’s last chance for peace and security, but the postponement will compel the United States to re-examine its long-term policy in Somalia. For external consumption, Somalia’s new Transitional Federal Government (TFG) describes the Somali conflict as a struggle against international terrorism; in reality, much of the fighting is due to historic animosity between some of Somalia’s largest clans. In Mogadishu, the Darod-dominated TFG is engaged in a running battle against the Hawiye clan, which were the largest backers of the Islamic Courts Union (ICU), the Islamist government expelled from power by last December’s Ethiopian invasion. The United States has released funding for the reconciliation conference while urging the TFG to reach out to the banned Islamists to encourage their participation. The TFG offered the Islamists a chance to register as elected clan representatives, but with no assurances of security. Islamist leaders, who claim the true aim of the conference is to “legalize the Ethiopian occupation of Somalia,” responded with demands for a neutral venue and the full withdrawal of Ethiopian troops (Goobjoog, May 24). In the meantime, roadside bombs explode daily and an intensive campaign of assassinations is taking a heavy toll on Somali leaders. Former ICU leaders are attempting to unite various opposition factions in a national movement for the liberation of Somalia from “foreign occupation” (The East African [Nairobi], June 18). The insurgency is also placing great pressure on formerly peaceful Somali territories like Puntland and Somaliland. The TFG has given U.S. forces the “green light” to carry out counter-terrorist operations inside Somalia, such as the recent attack on Islamists in Puntland (a semi-autonomous region in northeastern Somalia). Set up in 1998 as a self-governing refuge from the chaos prevailing in the rest of Somalia, Puntland’s single-party government has become increasingly authoritarian in recent years as it tries to prevent political Islam from taking hold. Public unrest is growing as the national treasury grows mysteriously dry, services are curtailed and soldiers and civil servants go unpaid. The administration recently signed several natural resource exploration deals with Western and Arab companies without public consultation. In the last days of May, the Puntland regional administration announced that two speedboats carrying 30 to 35 al-Qaeda “terrorists” had arrived in Baargaal district. Puntland officials claimed the foreign extremists came from the Ras Kamboni region of south Somalia, close to the Kenyan border. One of the men was said to be a suspect in the 1998 U.S. Embassy attacks, while insurgents from the United States, Sweden, Yemen, Morocco and Pakistan were allegedly part of the group. Six insurgents were reported killed by local troops, while the rest fled to the mountains near the Baargaal district where they were bombed on June 1 by U.S. warplanes and shelled by the five-inch gun of the U.S. destroyer Chafee (a now rare example of a ship-to-shore bombardment). There were reports of civilian casualties in a group of nomads, but no evidence that the militants sustained any damage from the bombardment (Puntland Post, June 2). Religious elders from Baargaal gathered later to announce that no foreigners were part of a group of local fighters attacked by the United States and Puntland regional government forces, describing any assertion to the contrary as a “fabrication” (Somaaljecel, June 5). The assault on Baargaal came five months after similarly unsuccessful attacks near the Kenyan border by U.S. AC-130 gunships. Somali sources continue to report U.S. troop movements along the Somali side of the Kenyan border (Shabelle Media Network, May 22). U.S. Assistant Secretary of State for African Affairs Jendayi Frazer claims that U.S. intelligence has confirmation of 30 al-Qaeda members active in Somalia and neighboring areas (ANGOP [Luanda], June 5). The U.S. special envoy for Somalia, John Yates, also sees an al-Qaeda hand behind the violence: “Because of the kind of fighting going on in Somalia, we suspect that there are still al-Qaeda related individuals in Somalia” (Shabelle Media Network, June 1). Perhaps appealing for continued U.S. support, TFG Prime Minister Ali Muhammad Gedi described a threatening future for Somalia in which al-Qaeda will pursue its “satanic plan of turning the country into a breeding ground for terrorists from all over the world and a safe haven for all outlaws and violators of international legitimacy” (al-Sharq al-Awsat, June 5). In early June, a car bomb set off by a suicide attacker nearly killed Gedi at his home in Mogadishu. It was the fourth attempt in recent months to kill the prime minister. Gedi described the attack (which killed seven guards) as the work of al-Qaeda: “The suicide bombing is a new and alien culture in Somalia…They collaborated with terrorist groups abroad and used technologies that the Somalis do not know” (al-Sharq al-Awsat, June 5). Likewise, U.S. special envoy John Yates observed that the tactics used in the May roadside bombing that killed four Ugandan soldiers “were very much like the tactics that al-Qaeda and other terrorist movements have used in the past.” A Ugandan government investigation, however, later concluded that al-Qaeda played no part in the attack (Shabelle Media Network, May 18; Shabelle Media Network, May 21). Not all TFG officials agree on the al-Qaeda threat. On June 6, Mogadishu’s mayor, former warlord Mohamed Dheere, declared that “the Hawiye are now to blame for the bomb explosions in Mogadishu” (Shabelle Media Network, June 6). On the same day, TFG troops arrested the chairman of the Hawiye Committee, Haji ‘Abdi Iman Umar, during a series of raids and arrests. Haji ‘Abdi has denied any involvement of the Hawiye elders in the attacks (Radio HornAfrik, June 7). Bombings and assassinations of regional administration heads in Banadir district were attributed to Hawiye activity in a meeting of the regional council on June 3. In the Gedo region in southwest Somalia, local officials recently held talks with Ethiopian officials to refute allegations that al-Qaeda operatives were concentrating there for attacks on Ethiopia (HornAfrik, June 6). The regime of Ethiopian Prime Minister Meles Zenawi has realized that talk of an impending Ethiopian withdrawal only emboldened the insurgents while doing nothing to hasten the arrival of the balance of the African Union peacekeeping mission, known as AMISOM. According to Zenawi, “Our defense forces will remain until they accomplish their mission…However, this does not mean that we want or can stay in Mogadishu or in Somalia indefinitely” (Ethiopian TV, June 10). A day later, Zenawi appealed to the Security Council to fund the cash-short AU mission, referring to the “financial burden Ethiopia is shouldering” (Shabelle Media Network, June 11). The Ethiopian army is preparing new operations against ethnic Somali rebels and their Oromo allies in the Ogaden region, where oil exploration efforts are already underway. Zenawi describes these groups as tools of the Eritreans in their efforts to destabilize the Ethiopian regime. In response to retaliatory strikes on ethnic Somalis in the Ogaden, the Ogaden National Liberation Front (ONLF) has promised to “become more vicious” in its attacks. There is always the possibility that Ethiopia may decide the best way to keep a lid on the resistance is to continue occupying Somalia until the Ogaden and its natural resources are secured, but Ethiopian troops targeted daily by roadside bombs and grenade attacks will have little appetite to stay put. Lately, Zenawi seems to be suggesting that the eradication of terrorism in Somalia is not the objective of the Ethiopian occupation force. “It can be asked whether there exists a city where there are no terrorists,” he explained. “There can be terrorists hiding in other cities, let alone Mogadishu. So it is impossible to confidently say Mogadishu will be 100% free of terrorists. You cannot also be sure about Addis Ababa or New York, let alone Mogadishu…Even now the situation in the city is not that bad” (Ethiopian TV, June 10). The assassinations and grenade attacks on Ethiopian troops have spread from the capital to Hawiye-dominated Beledweyn in central Somalia. In Somalia, there are many motivations for violence: the southern port of Kismayo is being fought over by TFG troops divided along clan lines; clan fighting in Mudug region erupted over a pool of rainwater during drought conditions; in Baidoa there have been horrific and unclaimed grenade attacks on a bank and a crowded cinema. On June 15, NATO offered to provide airlift services to AMISOM member nations to speed up deployment (Shabelle Media Network, June 15). Thus far, however, only a Ugandan Battle Group of 1,500 men has arrived from a projected AU force of 8,000. Burundi announced that it will send 1,820 troops to Somalia by French airlift in July, but Ghana appears to be waiting for a cease-fire in Somalia before it deploys, although it has also cited a lack of equipment and logistical support from the AU. The mission comes just as the AU mission in Darfur is on the verge of collapse, with Rwanda and Senegal threatening to withdraw their troops. UN Undersecretary General for Political Affairs Lynn Pascoe recently stated that the UN was considering taking over Somalia’s political direction and reconciliation efforts while seeking to reinvigorate the AU’s peacekeeping mission (Radio Simba, June 9). The Security Council also agreed there was an urgent need to prepare plans for a possible UN peacekeeping force. The TFG is now stating its preference for a UN force (Shabelle Media Network, June 15). The U.S. hunt for largely inactive al-Qaeda suspects in Somalia is proceeding at great risk to its reputation in the area. Its open alliance with Ethiopia and support for the Ethiopian occupation force have created an atmosphere of mistrust in fiercely independent Somalia. Despite enormous material and political costs, not one of the three foreign al-Qaeda suspects alleged to be taking refuge in Somalia (and wanted by Washington for their roles in the 1998 embassy bombings in Kenya and Tanzania) has been killed or captured. In a May 23 webchat, Michael Ranneberger, the U.S. ambassador to Kenya, seemed to be backing off from the “ICU equals al-Qaeda” equation that has dominated recent U.S. policy in the region and is impeding reconciliation efforts. “I recognize that the Islamic Courts did manage to establish a degree of order in Mogadishu,” he said. “However, the Islamic Courts never had broad support among the Somali people and, importantly, the Islamic Courts were moving in a very radical direction, which would not have been to the benefit of the Somali people” (USINFO, May 23). Use of the U.S. military’s four bases in the region (Camp Lemonier, Djibouti; Manda Bay, Kenya; Bilate and Hurso, Ethiopia) to conduct pre-emptive military operations designed to collect local intelligence and to seize or assassinate individuals deemed threats to national security. Containment through continued naval operations and surveillance over-flights, while rebuilding the Somali navy to undertake coastal security duties. Consolidation of the Ethiopian military presence with U.S. funding. De-emphasis of the military option in favor of promoting inclusive national reconciliation and U.S. engagement in reconstruction efforts. Turning the problem over to the UN by encouraging and funding a UN peacekeeping mission to replace the faltering AU effort. Military occupation by U.S. forces (the most unlikely option). Inclusive national reconciliation, support for AMISOM, increased development assistance and training for local security forces are the new cornerstones of a shifting U.S. policy in Somalia. The United States hopes for a transition to a democratically-elected government by 2009. In the meantime, the international community is waiting to see the results of the reconciliation conference before forming solid assistance plans. Anxious Somalis also wait to see if their country is destined for peace or to serve as the latest battleground in the war on terrorism. During the month of May, Ethiopia faced a series of attacks from its own ethnic-based rebel groups. The attacks come as a consequence of its invasion of Somalia last December, as the groups are attempting to take advantage of the Ethiopian army’s entanglement. The U.S.-backed government of Ethiopian Prime Minister Meles Zenawi now faces a new phase of armed resistance in the Muslim Ogaden region, which occupies nearly a third of modern Ethiopia and is home to four million ethnic Somalis. The recent discovery of substantial oil and mineral resources in the Ogaden region has complicated an already long-standing dispute over the territory’s status. In the Ogaden, China and Malaysia are intent on reproducing their success in dominating Sudan’s oil industry. The Orthodox Christian Amhara and Tigrean ethnic groups form 40% of Ethiopia’s population and have traditionally formed the power base for the Ethiopian government. Zenawi’s Tigray People’s Liberation Front (TPLF) is the leading element in the coalition government, known as the Ethiopian People’s Revolutionary Democratic Front (EPRDF). In May 2005, the EPRDF reassessed the results of a general election in which the regime was apparently defeated. The recount resulted in an EPRDF majority, and opposition to the result was ruthlessly repressed. Opposition forces regularly point out that most senior government positions are in Tigrean hands, even though Tigreans represent only six percent of Ethiopia’s population of 75 million. Political violence has afflicted the Ogaden region since its conquest by Ethiopia in the late 19th century. Ethiopia is determined to avoid a repetition of the Ogaden War of 1977-78, which began when Somali dictator Siad Barre committed four mechanized brigades in support of ethnic-Somali separatists in the Ogaden. An airlift of military equipment and aircraft from the Soviet Union and the deployment of 10,000 Cuban regulars allowed the Ethiopians to repel the invasion after more than a year of intense fighting. Today, the armed resistance is led by the Ogaden National Liberation Front (ONLF). The Ethiopian government’s presence in the Ogaden has been almost entirely military in nature since its conquest, with little effort extended to develop the region. Ogaden human rights groups complain of the brutal military rule that has disrupted traditional social systems and devastated the local economy (Ogaden Human Rights Committee, Press Release, April 29). The government has also been accused of mismanaging local wildlife resources, exploiting limited water resources and allowing the charcoal industry to raze the region’s forests. 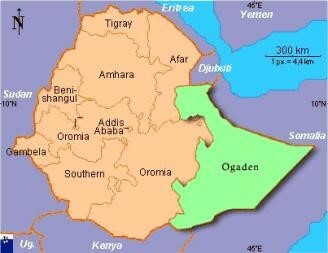 The people of the Ogaden have also been denied a voice in the development of promising mineral and petroleum deposits. Contracts are negotiated in Addis Ababa, and the exploration companies arrive with large detachments of government troops. Last November, Swedish oil company Lundin Petroleum was warned by the ONLF that its exploration activities in the Ogaden were “both unrealistic and unwelcome.” The ONLF advised foreign exploration companies that Ethiopia does not control the Ogaden and that their security guarantees are worthless (Afrol News, November 14, 2006). Malaysia and India, likewise, have oil exploration firms active in the Ogaden region. On April 24, the ONLF’s “Dufaan” commando unit attacked a well-guarded Chinese-managed oil exploration site near Obala in the northern Ogaden region, resulting in the deaths of 65 Ethiopian soldiers. Nine Chinese workers were killed while a further seven were abducted “for their own safety,” but released a week later (ONLF Communiqué, April 24). After the attack, Ethiopia’s parliament blamed the ONLF’s backers in Asmara, accusing the Eritrean regime of engaging in “international terrorism activities” (Ethiopian News Agency, May 10). 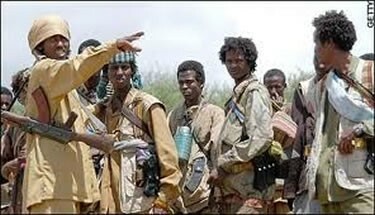 According to rebel sources, the ONLF followed up its oil-field attack by taking the town of Kefalo on May 15 (http://www.oromoliberationfront.org). The ONLF accuses Prime Minister Zenawi of currying favor from Western states by presenting himself as an ally in the “war on terrorism” and by suggesting that the ONLF has ties to al-Qaeda. The ONLF denies using terrorism, emphasizing that the movement restricts itself to attacking only legitimate targets of the regime. The ONLF has entered into an alliance with the Oromo Liberation Front (OLF) to confront “Abyssinian colonialists.” Unlike the Somalis of the Ogaden, the indigenous Oromos have mixed with their Amharic neighbors since the 17th century. Today, Oromos can be found in all parts of Ethiopia and many modern Ethiopians are at least part Oromo. Not all Oromos support the creation of an independent “Oromia”—the Oromo People’s Democratic Organization remains part of the EPRDF ruling coalition. With nearly equal numbers of Orthodox Christians and Muslims (and a small Protestant minority), the Oromo movement is nationalistic rather than religious in character. The OLF encourages all of Ethiopia’s disparate opposition groups to join a new umbrella group, called the Alliance for Freedom and Democracy. 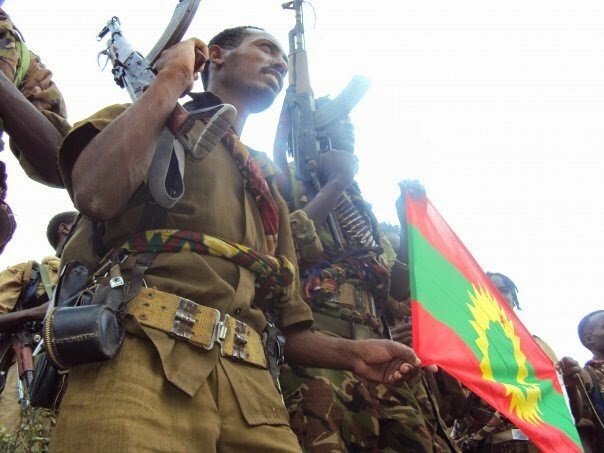 Rebel reports claim that a joint OLF/ONLF operation in the Ogaden’s Warder province killed 82 government soldiers and wounded a further 75 during six days in May (Voice of Oromo Liberation, May 17). The Ethiopian government denied these reports, describing them as simple attempts to gain media attention (Daily Monitor [Addis Ababa], May 23). Ethiopia is following an ambitious long-term project to become a major East African energy supplier through oil exports, to construct five major hydroelectric dams and to provide a connection between the North African and South African power grids. In the meantime, the Zenawi government depends on U.S. support for its survival. The armed resistance has perceived a window of opportunity, as a large number of Ethiopian troops and military resources remain engaged in Somalia and are unable to withdrawal without the arrival of a larger African Union peacekeeping force than the 1,500 Ugandans already deployed. Despite the TPLF regime’s characterization of opposition movements as “terrorist” in nature, neither the ONLF nor the OLF appear on the U.S. or EU lists of designated terrorist organizations. These movements have been joined in their opposition to the regime by other ethnic-based opposition groups, including the Afar National Democratic Front, the Tigray People’s Democratic Movement (TPDM) and the Ethiopian People’s Patriotic Front (Amhara). The TPDM claims to have inflicted 127 Ethiopian government casualties in a May 7 battle in the Tigrean homeland in northwest Ethiopia (Voice of the Broad Masses of Eritrea, May 12). Many of these groups receive support from the TPLF’s enemies in Eritrea. Zenawi is currently faced with a dilemma: with no sign of AU reinforcements for Somalia, his U.S. sponsors are demanding that the Ethiopian army remain in Mogadishu despite the desperate need for these troops at home.